by Richard Rebich, Unit Committee Chairman, Troop 8, at First Baptist Jackson. Sunday, February 11, 2018, is Scout Sunday. It’s the day that the Boy Scouts of America designate as the primary date to recognize the contributions of young people and adults to Scouting across the nation. This Sunday is especially meaningful to nine boys at First Baptist Jackson who have attained the highest rank in Scouting, the Eagle Scout Award. The path to Eagle is not easy, and it’s not intended to be. One of the new Eagles, Emmanuel Owah, talked with me about his journey. Emmanuel was born in Nigeria and came to the United States with his family when he was four years old. Emmanuel and his family have been active members at First Baptist since that time (I remember Emmanuel being very shy during the early days of AWANA when he started with us as a child!). Emmanuel’s journey took a little longer than some of the others. He completed his Board of Review a month before his 18th birthday, which is the cutoff for becoming Eagle! Emmanuel is involved with several sports at school including football, basketball, and track which created lots of distractions as he became older. 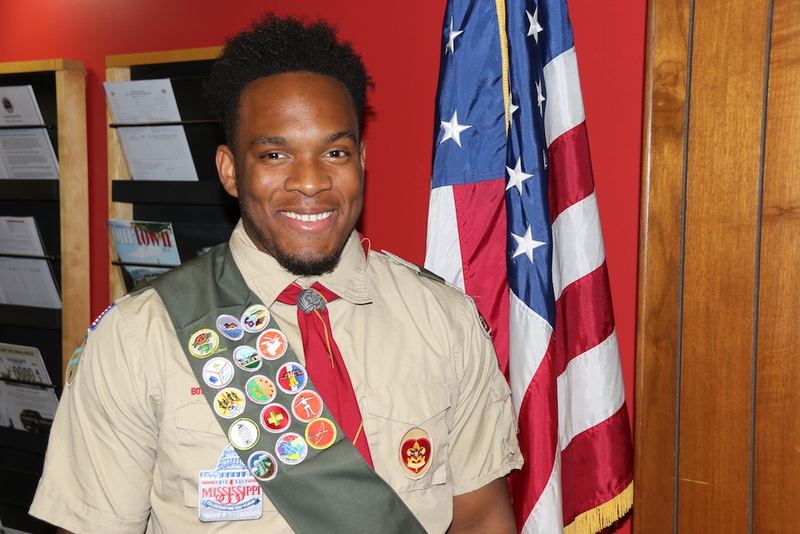 Emmanuel credits several of Troop 8’s leadership and volunteer dads for seeing him through the finish line. Emmanuel said, “it felt like all of First Baptist was behind me most of my life” and especially during his journey to Eagle. To demonstrate leadership, each Eagle is required to complete a service project in our community. 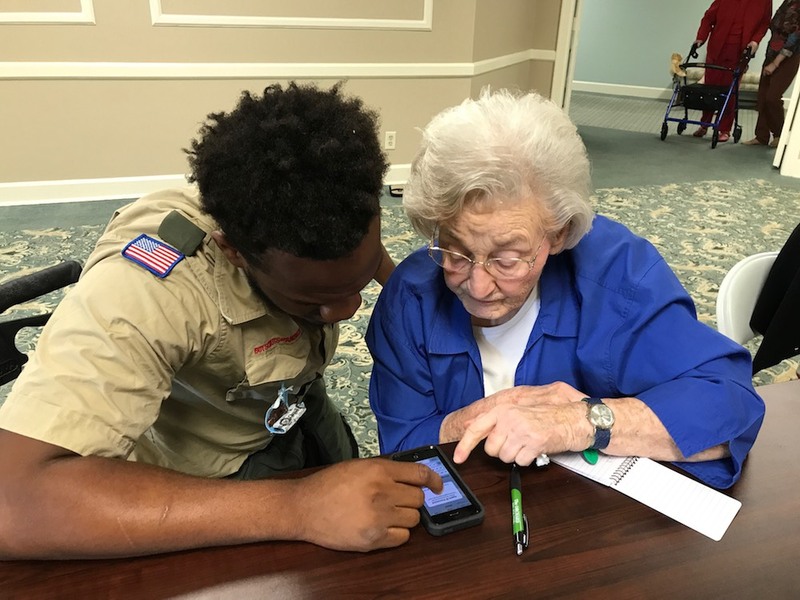 Emmanuel led a team of Scouts to demonstrate and teach residents at a local senior living center how to use their smart phones. This project was a follow-up to similar Eagle projects with that same senior community and was a tremendous success (to be honest, I’m hoping Emmanuel can teach me how to use my smartphone!). This is what the Troop 8 ministry at First Baptist Church really means – this ministry provides direct contact from men in our church and our community to mentor our young men during pivotal times of their adolescent lives as they grow and become men of God. They learn a lot of outdoor skills, but also are instilled with leadership from their Boy Scout experiences and life lessons along the way. We thank the congregation and leadership of First Baptist Church for this ministry and the partnership we have enjoyed since 1921. Scout Sunday is a special day for Troop 8 each year. Our Scouts and their families will be joining our congregation for worship, and our newest Eagle Scouts will be presented a Bible from our church family. All Eagle Scouts are invited to pick-up and wear a red commemorative lapel ribbon, available at the Welcome Center on the second floor. After the service, more than 350 scouts and guests will enjoy a banquet and the Eagle Scout Court of Honor. Congressman Gregg Harper will be our keynote speaker. The nine new Eagle Scouts are: Robert Walker Headley, Michael McCormick Hederman, William Charles Meck, Mason Grey Nichols, Emmanuel Omagha Owah Jr., John Martin Parrish, Charles Lee Stephenson, Robert Wesley Thomas III, and William Blake Fletcher. Most of these new Eagles have strong ties to the First Baptist Church family. Learn more about Scouting on the First Baptist Jackson website.